To United States Shipping and Handling is $3.00. Use the button below to purchase. $3.00 S&H charge will be automatically added. To Canada Shipping and Handling is $8.00. Use the button below to purchase. $8.00 S&H charge will be automatically added. To the world Outside of North America and Hawaii shipping and Handling is $10.00. Use the button below to purchase. $10.00 S&H charge will be automatically added. Below are some features of the disk. 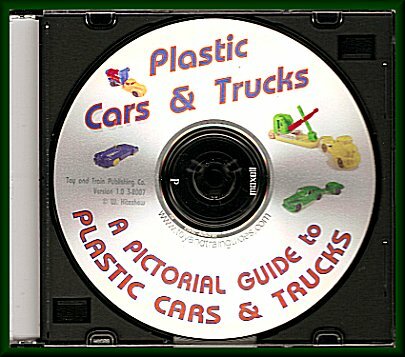 It has 840 pages showing 702 vehicles. There are more than 790 color photographs. The CD is menu driven by manufacturer and includes several original drawings. If you love these little toys this CD is for you. It does not promise to show everything you might have but it is a good starting point for the identification and evaluation of these cars and trucks.